Well as usual another interesting week behind me. So I had a minor surgery on my left foot with a small stone being removed that was actually tapping against my foot bone. Luckily it was small and had bypassed muscles and tendons without injury. Phew. I also had some damage to my left ankle, which one was a very small sprain, and two was nerve damage. Ironically I can RUN on the ankle with out too much ado, but still struggle with WALKING on the ankle. When I run I go forefooted and keep my heel up. When I walk i roll heel to toe and wince in pain, so I walk now with a slight limp as I keep on tippy toes. Physio is treating me for this and there is daily improvement, but the treatment is my back, as when I tripped a couple of weeks ago I trapped a nerve. Medical science and the body is amazing. My additional medical nugget is this taping lark. So I have a bright blue band taped along my leg and around my foot…apparently it alerts my brain there is an issue along that area and the brain applies some TLC to the area. How very smart. 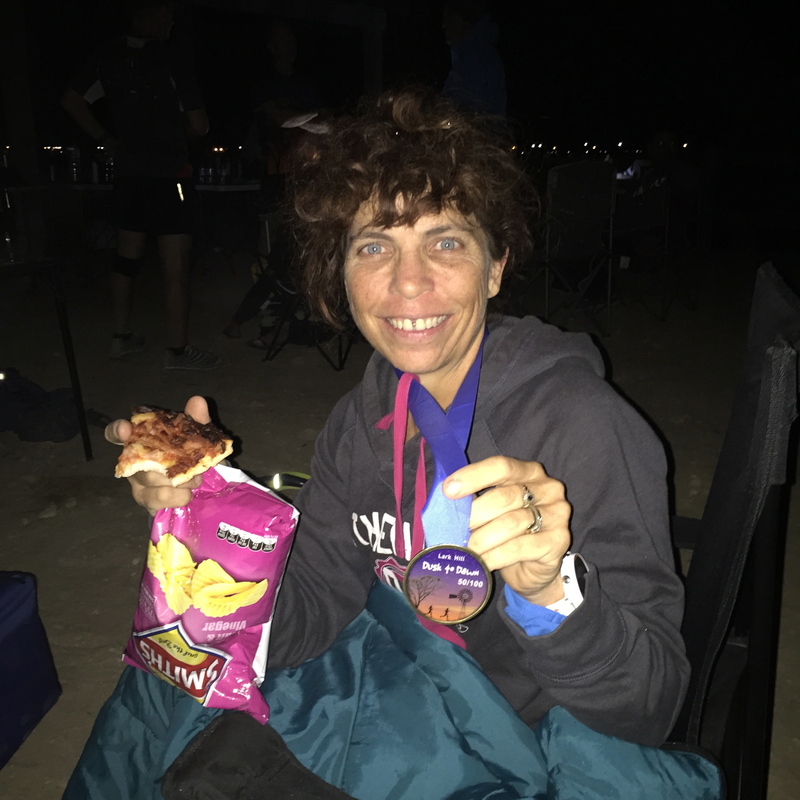 I was placed on total rest for a full week..no running, walking or too much standing and daily physio..all in the attempt to keep me run ready for my 50km ultra on a 3km trail loop. I also learned another fantastic new little trick…using GELS and gel bottles. Now I have never been a fan of gels. a) the flavours of every single one I have tasted previously were plainly yuck. b) They are messy and sticky and c) yet something more to carry. Then when I had my gut troubled run and my running buddy Hannah, encouraged me to at least try a gel to get me to the end, I was pleasantly surprised, or my body was relieved to get a fuel dose, that vanilla bean is my flavour of the month! So this run was going to be fuelled with gels. Last minute panic as I do not normally buy them, and on Saturday event day, I decided to nip out and do some gel shopping..Only my little village does not stock these. Ooops. Some panic calls to a couple of local runners I know and found a supplier..phew. Prepping for the big event I have a teleconference with Hannah re our drop boxes for our self managed aid station. Hannah tells me a tip to put 4 gels into one of the little gel bottles I have received in race packs before. Wonderful..4 gels and a little water to dilute, all neat and clean in a little bottle. I have 50km to run, so prep myself two little bottles. And guess what…where can I put the little bottles? A little body glide at the cleavage and pop the gel bottle into my bra :)…No..no photos for this one! Additionally I ran this run with a small 300ml hand held bottle of water and my gel squeezy in my crop top. Did not bother me at all on the run.. Impressed for lighter running. My choice of footwear remains with my neandersandals for the trail courses. However this time I hit a snag. At 42km, I tripped quite badley and landed up ripping the front lace out when the sole folded under my foot. So sandal broke. Now I had tied on well, laces were secure, and when you are running/hopping and do not have time to stop, untie and unlace, these neandersandals are a mission to remove! So managed to wriggle my foot out of the broken sandal, and then just pushed on with one neandersandal on, and one off – which was done for 3.5km. When I came past the aid station the second time in my hapless state and I was running out of time, I knew my ankle would not support lopsided running at pace, so I took a few seconds to virtually rip and wriggle my way out of the remaining sandal and headed off barefoot. This was not a decision. When we started out and had done the lap a few times, I realised I could have done the course barefoot, but prior to commencing, I was unaware of what we would be running on…, I was comfortable as I was, but secure in the knowledge that if need be, I could easily go barefoot. As for the run..I completely missed the ball park when I failed to fuel up with some food at the 30-35km mark..Why I do not know…this was exactly the same place I missed when I did my first (and only to date marathon), and so just after 42km I bonked. Big time. Epic fail. That was the most toughest mental game out. I was so so so angry with myself, and then my other self kept telling me to stop beating myself up, it was not a programmed ‘race’ in my calendar, there is another one..my competitive self was yelling NO No No..you are stupid, push on, do not give up, keep going. I got to the stage where I was wibbly wobbly and weaving every where. When my legs would not work they were cramping and spasming so bad, that I was actually using my hands to pick my legs up and place them one in front of the other, and pushing down on each thigh to force a step…Finally made it back to the aid station and took some dried fruit..but it took a few more km’s to have any effect. Not only that I had under loaded my tailwind. I should have used a full scoop per bottle, and at this point saw with clarity that I had used a half scoop..what I normally use on my little regular training runs over 10km’s..just for heat compensation. What a rooky mistake. Well I made some serious mistakes that cost me well on 20 minutes..mistakes that were avoidable and costly. I also forgot basic maths 17 x 3km = 51km and I did not factor time in for the extra 1 km to run.. to focused on the race name “Dusk to Dawn 50km Ultra”. I just made my sub 5 hour target with 37 seconds to spare…a time of 4 h 59 min 23 seconds..My position being 4th lady in..avoiding my mistakes may have seen me placed higher. Never expected to be so close to the to female runners, (10 minutes between 2,3 & 4th) so for that I am stoked! I suffered for a full hour with terrible cramps and spasms from lactic acid burnout..something I vow never to repeat. But as can be seen, made sure I fuelled up hugely afterwards :). My feet are fine. Did not even notice the terrain I was on. Went out for a little 10km recovery jog today in my real barefoot, and felt at peace again. What I have struggled with post race is exhaustion. Not muscle soreness..feel absolutely fine there..but sleep deprived. I was up at 7:30am on Saturday morning, awake through the night till 7:30 am the following morning – 24 hours, then struggled to make my way home, stopping twice for a 5 minute nano nap on the side of the road, and once home drifting in and out of dozing over the day. Only felt “sleep” ready at 8pm, which was 36 hours later..and woke up this morning a lot more refreshed. I am an old duck here. I need my sleep. 9:30 pm is a late night for me, and later than that I take a few days to recover from. Loosing a whole 12 hours of sleep is a massive shock to the body and the system! Hi, I am in my mid forties and run barefoot. Mostly really barefoot, sans any form of foot protection. My claim to fame for this blog, is that I have run my first full marathon completely and really barefoot, in a respectable time of 4:16. Scroll through my posts and enjoy them - all with a good sense of humour too. My story is simply my story of running barefoot, brought about by all the various questions people ask me. I am not a specialist of any sort or any particular athlete or doctor or guru. 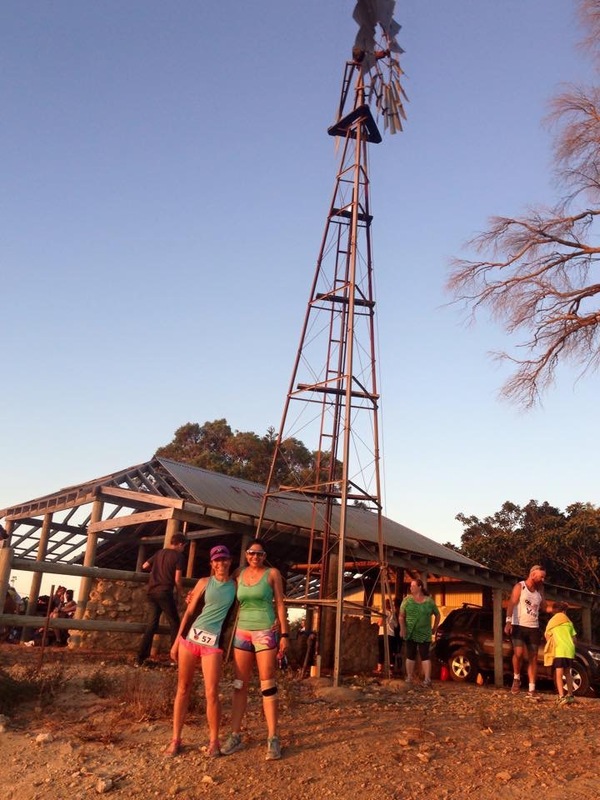 I am an average woman who runs barefoot, enters a few club runs and a few fun runs. I run races from 5km to marathon. 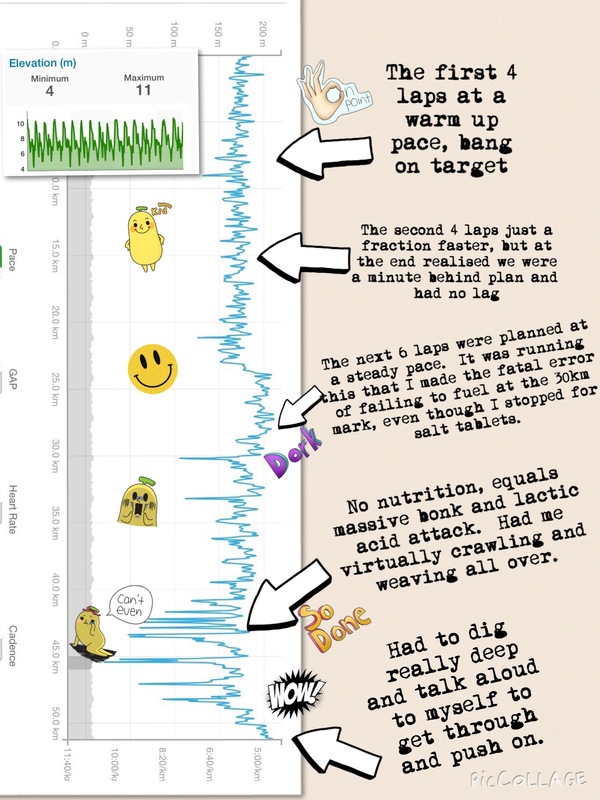 I love trail running, and include chats about my trail adventures. To date, although I only started running end of August 2013, I have done nearly 2000km, of that at least 1500km in barefeet. Real barefoot. No minimalist shoes. 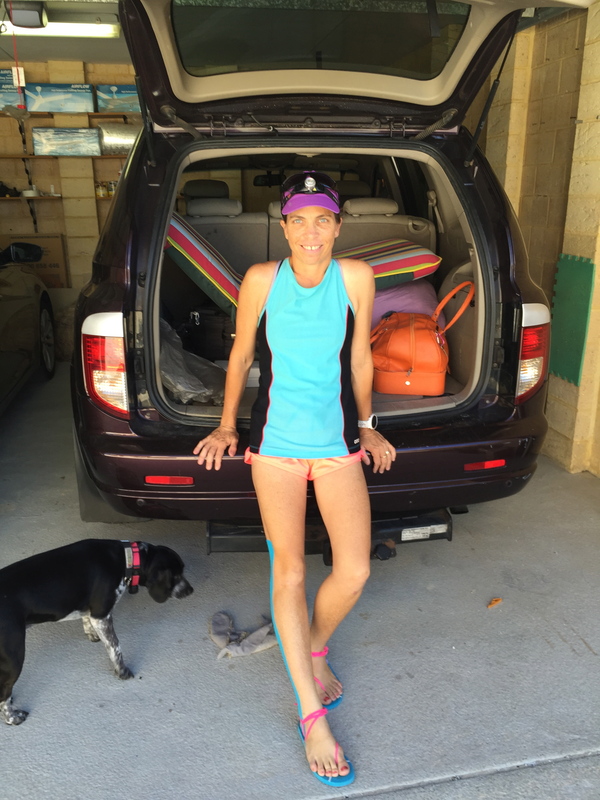 Although when I do run in shoes I use my zero drop mimimus ones (haha - they are my ONLY pair of running shoes..) The blog tells of my journey through life, on the road, barefoot. The journey my real barefeet go through when they connect with the road. The emotions my real barefeet bring out - in me, in passers by, in fellow runners. The aggressive reactions and debates as to the well being of the real bare-feet I run in. The passive acceptance of my real bare-feet and their exposure to the elements. The humour to show those real bare-feet of mine are not just a piece of running equipment, a statement, a leftie or a rightie, but real flesh and blood feet with real issues. An interesting post note..I commenced my first active run in August 2013 progressing sporadically. But it really was only from May 2014 that I started running on a consistent and slightly more serious note and slightly faster than walking pace. I am scheduled to run my Comrades Marathon in May 2015..that is a massive progression from walk/shuffle er um excuse me look at me run.. to aiming to run a World famous Ultra. Some one pinch me please! « Recovery..No..its forced injury recovery. I’ve read your article, glad all went well.